The seven main goblin tribes each own a sacred Goblin Totem Staff, usually located in their respective lairs. If the totem is stolen and dropped somewhere, a recovery party led by the tribe's War Chief will attempt to find it and return it to their lair. Apart from causing havoc for any settlements the goblins might pass by on their way to recover the totem, the party usually encounters no resistance. If, however, the totem is placed inside the lair of another goblin tribe, the two goblin tribes will be hostile, and the party will likely be prevented from recovering their totem, thus starting a goblin war. The mechanics of a goblin war are complex: only the War Chief can pick up the stolen totem, meaning that the raid is ultimately futile if he dies. Berserkers and Skirmishers will follow the War Chief, but are unable to pick up the totem and will simply return home upon his death. Both Skirmishers and the tribe's Shaman can pick up the staff, but only if it's dropped within the correct zone of their lair, making them useless at recovery during a war. The tribal goblins respawn,[verification needed] creating a never-ending war if they fail to recover their totem. This sometimes results in large, incredibly dangerous masses of hostile goblins wandering the countryside and within the lairs. The totem staff of the Bloody Hand tribe of Cracked Wood Cave is located in Timberscar Hollow, the lair of the Rock Biter tribe. This war is the subject of the quest Goblin Trouble. The totem staff of the White Skin tribe of Goblin Jim's Cave is located in Derelict Mine, the lair of the Sharp Tooth tribe. 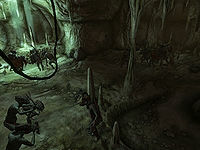 Wars can be triggered by the player by placing the relevant totem staff in another goblin lair. They can also be ended, either by keeping the totem in a container, returning the staff to the goblins, or killing the tribe's Shaman (which turns all members of the tribe passive). The only exception to this is the White Skin tribe, whose Shaman is a Breton called Goblin Jim. Jim's death won't affect the tribe's aggression, so taking or returning the staff from Derelict Mine is the only way to end the war (see bugs). It's worth noting that the inhabitants of generic goblin dungeons will not oppose the recovery party, nor will the Bitterfish tribe, which doesn't function like any other tribe. While very similar, the Goblin Shaman Staff taken from the Goblin Witch during the tutorial isn't a totem staff. For more information on the goblin tribes, see the main article. Goblin wars can often get out of control in regards to the amount of goblins in a single cell. This can result in a significant drop in framerate or a game crash. ? The Unofficial Oblivion Patch fixes the bug with Goblin Jim's death not affecting his tribe by adding the related script. This page was last modified on 25 October 2014, at 21:39.